We'd love to blast around in this off-road Continental. Usually, the only time we get to see exotic cars modified for off-road use is in rendering art. Sometimes, there is a rich person out there who is crazy enough to build an off-road monster out of something expensive and exotic. Bentley built the Bentayga to help cater to the SUV-crazed market, but it does have some off-road cred. Even though it can handle itself, most Bentayga owners will never take their SUV off-road. This is precisely why if it were our money, we'd forget about the Bentayga and buy this custom Continental GT instead. This off-road creation is based on a 2004 Continental GT. The car is currently for sale in the Netherlands by Classic Youngtimers. No price is listed, but the car currently has 85,166 km (around 53,000 miles) on the odometer. We wonder if those were "gentle" miles. The dealership has added extensive modifications to turn this Bentley into an off-road warrior. Custom additions include: a 3-inch lift, modified air suspension, front stabilizer, custom fender flares, roof rack, LED roof lights, custom roof-mounted spare-wheel, custom rear skid plate, matte black grill, custom exhaust and various other upgrades. 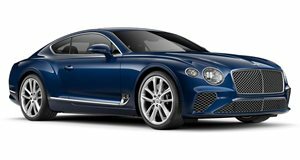 Theoretically, the Continental GT should be an excellent off-road car. The 6.0-liter twin-turbo W12 produces 552 horsepower and 472 lb-ft of torque going out to all-wheel-drive. Even with 20-inch wheels wrapped in all terrain tires, this Bentley should still be a beast on the street and off-road. Why buy a Bentayga and park next to all of the other rich people in their Cayennes and Range Rovers when you could have something truly unique?